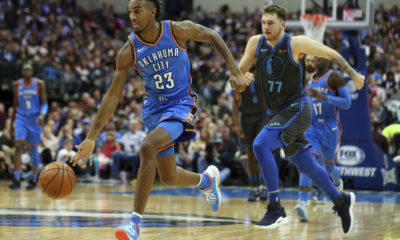 For the first time since the 0-4 start to the season, the Oklahoma City Thunder were on a losing streak coming into Saturday night’s matchup, but strong Thunder defense forcing turnovers, another dominant night from Paul George, and connecting on offense with unselfish basketball helped the Thunder get back in the winning column with a 110-104 win over the Los Angeles Clippers. The Thunder were coming off a 109-98 loss to Denver not even 24 hours before stepping on to the court tonight, but Paul George said it best when he acknowledged the two prior losses and said it was good to be back on their home court. 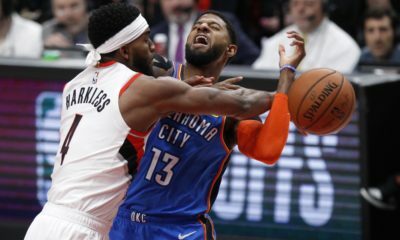 Paul George led the way for the Thunder picking up 33 points, 7 rebounds, and 6 assists, as well as one steal and one block. He shot 11-19 from the field and was 5-9 from downtown where he picked up two 3-pointers in the first quarter to help the Thunder outscore Los Angeles 30-25. George also went 2-2 from 3 in the second quarter to send the Thunder to the locker room up 61-50. Russell Westbrook had an unusual night on the floor not hitting a shot until close to halftime where he laid in a 3-pointer. He was able to have two consecutive 3-pointers coming out of halftime, and although he was nearly perfect from downtown, he ended 4-17 from the field. Westbrook finished the night off with 13 points, 9 rebounds, 12 assists, and 6 steals. 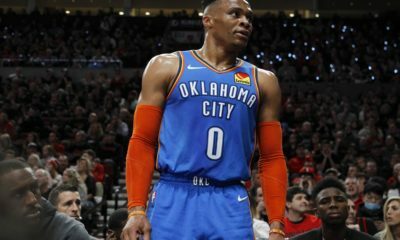 Even with a quiet night on the floor, Russ needed only one more rebounds to achieve yet another triple-double speaking volumes on how much of an impact he can create in any area, even when his shooting is not a strong suit for the night. The Thunder improve to 18-10 in the season, and the Los Angeles Clippers will drop down 17-12, 8-9 on the road. 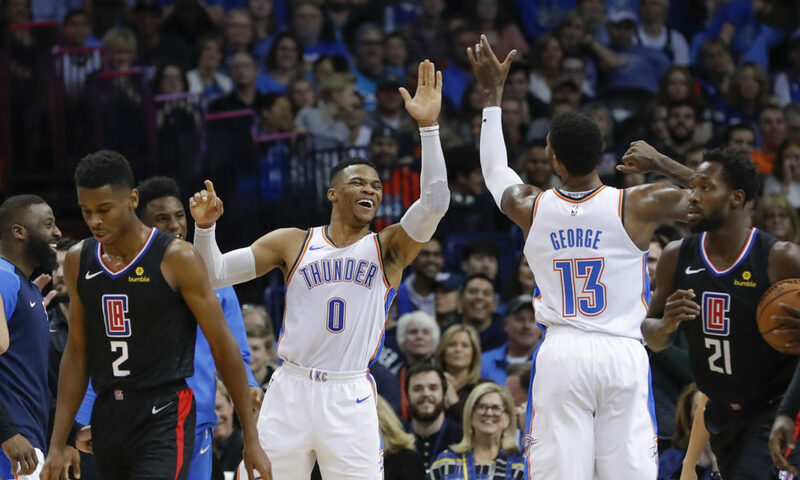 The Thunder will have an opportunity to avenge their disappointing loss to the Bulls earlier this season as Chicago comes to OKC on Monday night for a 7 p.m. tipoff. Watch below for Billy Donovan’s full postgame presser, as well as full locker room pressers from Russell Westbrook, Jerami Grant, and Paul George.